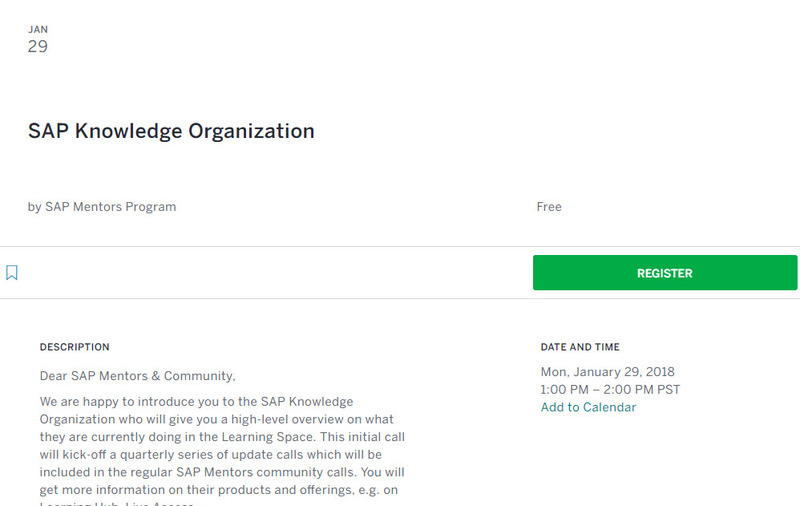 We are happy to introduce you to the SAP Knowledge Organization who will give you a high-level overview on what they are currently doing in the Learning Space. This initial call will kick-off a quarterly series of update calls which will be included in the regular SAP Mentors community calls. You will get more information on their products and offerings, e.g. on Learning Hub, Live Access, …. The SAP Knowledge team would also highly appreciate your feedback whether you are interested in special topics they should cover in this series. Please let us know if you have any topics whenever you would like to suggest a topic or simply share your thoughts with them. For a list of last year’s SAP Community calls, please see here. Did you know January 29th is Kansas Day? See you there? I take “Open SAP” is one of those “products and offerings” as well? And how about “classic” SAP Courses (e.g. drive to Walldorf for a week of training, or get a SAP trainer to your site)? Hi Joachim – please attend the webcast to find out…if not, I’ll try to remember your questions. Thank you for reading and commenting. Yes, openSAP, classroom training, SAP Learning Hub, and SAP Live Access are all part of the same SAP Knowledge organization under Bernd Welz.